I made this album in Nashville, Tennessee with producer Mark Moseley. He and my manager, Lee Williams, rounded up some of the most respected names in bluegrass. Many of them have received awards from the International Bluegrass Music Association (IBMA) for being the best in their field: Jim Hurst, who acted as band leader, (current IBMA guitar player of the year); Missy Raines (current IBMA double bass player of the year – and for the three years before that!) and Alison Brown (current IBMA banjo player of the year) and Rhonda Vincent (current IBMA female vocalist of the year with no less than 23 other major awards!!). On the tracks where Alison was not playing, I was very fortunate to have Charlie Cushman on banjo. Otherwise we had the marvellous Wayne Benson on mandolin, a brilliant young fiddle player called Jimmy van Cleve and my good friend and mentor, Ced Thorose, on resonator guitar. Sharing the harmonies with Rhonda Vincent was Monty Allen, who has the distinction of having been chosen by Dolly Parton to sing harmonies on her last two CD’s. I think this album contains some of the best songs I have ever written and I am delighted with the way it turned out. Though released last year, it has taken Charlie Boston’s latest album a long time to reach us but, with a few reservations, the wait has been more than worthwhile. The London-based bluegrass singer and songwriter has a rich musical pedigree with family roots in classical music, but his first love is American bluegrass. This latest collection was recorded in Nashville at the Sound Control Studio in Dogwood Place and features some great American pickers and singers, including Rhonda Vincent, Alison Brown, Jim Hurst, Missy Raines, Wayne Benson, Jimmy van Cleeve and Monty Allen. It’s tough doing convincing American bluegrass when your ethnic roots are in the UK, but Boston almost succeeds on this compelling album. British based, this gifted bluegrass lad should harvest considerable attention inside and outside the bluegrass community with this fresh album. It seems that everyone I’ve played this CD to have raved about his colourful song writing and performance, and started to beg comparisons with the finest. Although previously unknown to me, Charlie does not seem to lack experience and is soon to fully reap his dues. “Dogwood Place” was produced by Mark Moseley at his Nashville studio with top quality bluegrass sessioners. Charlie has trawled widely for his composition subject-material. If you enjoy sweet true-blue bluegrass fare this is highly recommended. A most competent songwriter, he specialises in story ballads. Each tenderly crafted story that is told bears the badge of age-old tales of life and love. Recommended! I met up with Charlie for the first time at the marvellous Nickel Creek gig recently and was well pleased listening to this music from a Londoner with twelve original songs sounding good over its thirty eight minutes running time. It was recorded in Nashville at the studios that give the album its title and produced by Mark Moseley who has worked with many British artists in Music City. Charlie is joined by his right hand man, Ced Thorose, who is an American but has lived in London for some thirty years and plays his self-built resonator guitar – a Dobro to you and me! There are another eight Americans included, especially Alison Brown and Rhonda Vincent, both of whom have played the Cambridge Folk Festival in the last two years. Each track has the lyrics printed in a sixteen page booklet with a short note on how each song came to be written. I particularly liked track two with its story line, the folksy melancholy of track four and track six, which tells of how he came to meet his dog, after whom the record label is named! Track nine was My Pick of the Album with CB joined by Rhonda on a melodious ballad, but all the songs are enjoyable and varied in rhythm and for those who, like me, aren’t dedicated bluegrass fans, this makes a good introduction to this genre of country music. The back cover legend proclaims “A bluegrass album of original song by Charlie Boston with Alison Brown (banjo), Jim Hurst (guitar), Missy Raines (bass), Wayne Benson (mandolin), Charlie Cushman (banjo), Jimmy van Cleve (fiddle), Ced Thorose (resonator guitar), Rhonda Vincent (harmony vocals) and Monty Allen (harmony vocals)”. The results are impressive and producer Mark Moseley has treated Boston’s songs – and voice – with great respect. If you didn’t know that Charlie Boston was one of ours, you’d swear that he hailed from New England, because his voice is about as Bluegrass as it gets, but without selling-out to his British roots with a superfluous twang. Charlie’s songs are wordy but meaningful and perfectly suited to this style of acoustic music. Bluegrass, of course, is currently undergoing a massive revival in the States and it might benefit him to invest in a Prime Cuts of Bluegrass promotional cut at some time in the very near future. Prime Cuts is very much in the vogue of Stuart Cameron’s Country Hotdisc compilations, and allows DJ’s around the world to sample the wares of countless Bluegrass and acoustic bands for a postage charge of around $18 per year. of his backing musicians uplifting. I have often despaired at the British country music scene, but when an artist of Boston’s calibre emerges, I sense a ray of hope. Charlie isn’t the first British artist to record in Nashville, but he is among the few to venture into Bluegrass and pull it off. Much credit must go to the beautiful harmony singing of Rhonda Vincent and the almost trademark “Charlie Boston Band sound” of the hugely accomplished Ced Thorose and his hand-crafted resonator guitar. A faultless album in every sense and it will be interesting to see if other artists pick up on Charlie’s songs, as they did with Britain’s equally gifted Charlie Landsborough. If Martin Cuffe is Britain’s best balladeer, Charlie Boston is undoubtedly Britain’s number one bluegrass performer and writer. With two great albums to his credit, “Driftwood” and “Truths & Fantasies”, recorded with his own band, the next logical step was Nashville and the studios and pickers afforded by Music City. 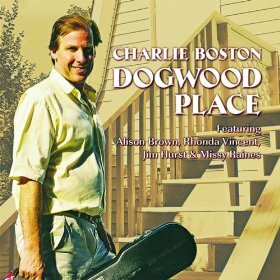 The album, “Dogwood Place”, was more than a dream fulfilled for Charlie. Along with long-time friend and band member, Ced Thorose, Charlie is joined by Alison Brown (banjo), Jim Hurst (guitar), Missy Raines (bass), Wayne Benson (mandolin), Charlie Cushman (banjo), and Jimmy van Cleve (fiddle). Monty Allen and the award winning Rhonda Vincent sing backup. The material is entirely Boston’s and you’ll not find stronger anywhere. Ten long nights, Last leaves of Autumn, Oh, my Saviour, and Fly like a Swallow are just a few of the gems featured. We talk of pedigrees in music. Who is related to who and we take for granted that these “relative” influences put our subject on the road to musical fame. Charlie Boston probably has the most notable musical pedigree of any current artist. Charlie’s great uncle was Sir Thomas Beecham, arguably the finest classical conductor ever and Robert Schumann, the German composer, was his great grandfather. So one would expect his forte to be the classics. Not so. Charlie’s mother is Australian and so her young son gained the folk influences of her native country but this did not route the young Charlie on his current career. Boston is, in fact, the UK’s top bluegrass performer and writer. His talents have so far generate two critically acclaimed albums, “Driftwood” and “Truth And Fantasies”, both containing all original material. The Charlie Boston Band can stand shoulder to shoulder with any in America. Across the Atlantic Boston would be a big festival favourite but here in the UK the bluegrass market is fairly limited. Charlie has, so far, shown little inclination to relocate but the forthcoming pressure he will feel from “Dogwood Place” (Lara) could be irresistible. Charlie actually went to Nashville for this project accompanied only by his resonator guitar player Ced Thorose. There the duo were joined in the studios by Alison Brown and Charlie Cushman (banjo), Wayne Benson (mandolin), Jim Hurst (guitar), Missy Raines (bass), Jimmy Van Cleve (fiddle) and, providing harmonies, Rhonda Vincent and Monty Allen. This latest 12-track Dogwood Place is his third release and like all his other work a pleasure to review. Forget about all the technical musical terms, when I hear something really special it sends shivers down my spine and that sensation has been felt with every one of his albums including this latest. To record Dogwood Place Charlie travelled to Sound Control Studio, Dogwood Place, Nashville, where it was produced and engineered by Mark Moseley. You will hear the following musicians Alison Brown (banjo) on two tracks. Jim Hurst (guitar), Missy Rains (bass), Charlie Cushman (banjo), Wayne Benson (mandolin), Jimmy van Cleve (fiddle), Ced Thorose (Diamond Back resonator guitar), Rhonda Vincent (harmony vocals on two tracks), Monty Allen (harmony vocals), Mark Moseley (harmony vocals on one track). It comes with a 16-page glossy booklet that contains all the song lyrics and how he got inspiration for each of them, also coloured photographs of everyone you will hear. The music you hear is an exquisite blend of bluegrass, folk, and country, the best way I can describe it is, if Charlie Boston were a distiller in the highlands of Scotland his blend and product would be a highly coveted malt whisky. The album opens with a banjo lead up-tempo “Ten Long Nights” – lyrics came from a stay in a third-rate French hotel. At random here are some of the others, “Like Yesterday” a kind of bluegrass sounding biography of Charlie’s life in Chelsea, London. It is his home base today with his wife and faithful dog. “Fairer Than The Sunset” this is a truly beautiful ballad about his dog Lara who came from Battersea Dogs Home. it will bring tears of joy to your eyes if you love dogs. “Oh, My Saviour” a great gospel number from a man who is not Bible punching or trying to convert our ways, just simply telling us he believes his life’s incredible luck must have had a helping hand. The play out track is “Fly Like A Swallow” it was not the song Charlie had chosen to close the album. Mark Moseley told him the day before the recording the first choice for the last song that it was too “hokey”, whatever that word means. So Charlie drove to the Peer Priest Reservoir, east of Nashville, sat on a rock and wrote this ballad. Possessing the ability and creative talent to write a song prior to entering the recording studio is an especially talented achievement. Hidden away in Chelsea, Charlie Boston and his music have to be one of England’s best-kept musical secrets. Where are the scouts for the big folk, bluegrass, and country music festivals? How have we all managed to miss such talent right on our doorstep? This latest album, like all his others is top quality and should not be missed. My Album Of The Month.